A new hand-held device that uses lasers and sound waves may change the way doctors treat and diagnose melanoma, claim a team of researchers from Washington University in St. Louis. The instrument, described in a paper published in Optics Letters, is said to be the first that can be used directly on a patient and accurately measure how deep a melanoma tumour extends into the skin. The thicker the melanoma tumour, the more likely it will spread and the deadlier it becomes, said dermatologist Lynn Cornelius, one of the study’s co-authors. Being able to measure the depth of the tumour in vivo enables doctors to determine prognoses more accurately – potentially at the time of initial evaluation – and plan treatments and surgeries accordingly. According to the University, current methods cannot directly measure a patient’s tumour very well. Because skin scatters light, high-resolution optical techniques don’t reach deep enough. ‘None are really sufficient to provide the two to four millimetre penetration that’s at least required for melanoma diagnosis, prognosis or surgical planning,’ said engineer Lihong Wang, another co-author on the Optics Letters paper. Researchers have tried other methods, such as high-frequency ultrasound which doesn’t have enough image contrast. Similarly, magnetic resonance imaging and positron emission tomography have insufficient resolution and require expensive and bulky instruments. ‘Any type of tissue diagnosis at this point in time requires taking tissue out of the person and processing it and looking at it under the microscope,’ Cornelius said in a statement. But because taking a biopsy often only involves the removal of a part of a tumour – when it’s in a cosmetically sensitive area, for instance – provisional measurements of the tumour depth are not always reliable. If, at the time of excision, the surgeon finds that the tumour goes deeper than initially thought, the patient may need another surgery. Recently, researchers including Wang have applied photoacoustic microscopy, which can accurately measure melanoma tumours directly on a patient’s skin, thereby allowing doctors to avoid uncertainty in some circumstances. 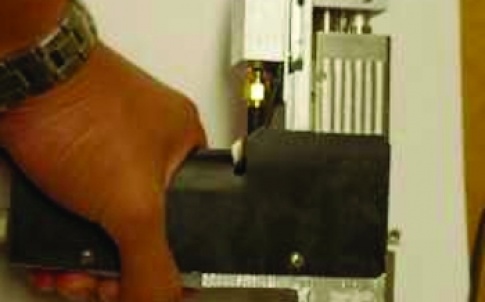 The technique relies on the photoacoustic effect, in which light is converted into vibrations. In the case of the new device, a laser beam shines into the skin at the site of a tumour. Melanin, the skin pigment that’s also in tumours, absorbs the light, whose energy is transferred into high-frequency acoustic waves. Unlike light, acoustic waves don’t scatter as much when traveling through skin. Tumour cells will produce more melanin than the surrounding healthy skin cells, and as a result, the acoustic waves can be used to map the entire tumour with high resolution. The device has a detector that can then turn the acoustic signal into a three-dimensional image on a screen. Wang, Cornelius and their colleagues previously built a similar desktop device, which shines the laser directly onto the tumour. But so much light is absorbed that very little penetrates to the tumour’s lower layers. The latest version, however, is not only hand-held, but it also delivers light around and below the tumour, which generates a bright image of the tumour’s bottom and an accurate measurement of its depth. The researchers tested their device on both artificial tumours made of black gelatin and on real ones in live mice, showing that the instrument could accurately measure the depths of tumours, and do it in living tissue. Initially, this tool will be mainly used for improving how doctors plan and prepare for surgeries, Cornelius said. But what’s especially encouraging, she said, is that it can measure a tumour’s entire volume, which has never been possible with melanoma. If researchers can determine how the volume relates to cancer outcomes, then this tool could give doctors a new type of measurement for diagnosis and prognosis. The researchers are now conducting further tests with human patients.